When Logic Planet hired Ms. Uppala, she signed an employment contract with it. That agreement includes a non-compete clause that prohibits Ms. Uppala from working directly for Logic Planet’s clients for a specified period. It also includes a liquidated damages provisions that requires Ms. Uppala to pay back $15,000 if she terminates her employment before her contract expires. Despite this agreement, Ms. Uppala quit her job with Logic Planet and began to work directly for one of the company’s clients. She claimed she did so because Logic Planet failed to provide her any significant training, did not place her on projects as it had promised, and did not pay her agreed-upon salary. Logic Planet sued Ms. Uppala, alleging among other claims that she (1) breached her employment contract, (2) interfered with Logic Planet’s contractual relationship with its end-client, and (3) breached her duty of loyalty to it. In response, Ms. Uppala asked the trial court to dismiss the claims against her based on the New Jersey Employment Agencies Act. 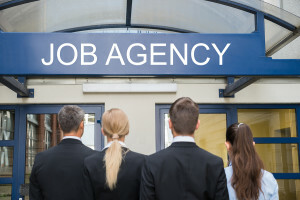 The trial judge explained that the New Jersey Employment Agencies Act requires employment agencies to obtain a license from the Division of Consumer Affairs. However, it ruled that “temporary help service firms” only need to register with the state, but do not need to obtain licenses. Under the statute, an “employment agency” is an individual or business that attempts to find jobs for individuals who are seeking work. In contrast, a “temporary help service firm” hires individuals who it then assigns to work for its clients. The key difference is whether the individual is employed directly by the end-client, as with an employment agency, or is employed by the agency but performs work for the client, as with a temporary help service firm. In Logic Planet Inc. v. Uppala, a published trial court opinion, the judge ruled that Logic Planet is a temporary help service firm since Mr. Uppala was its employee and received her compensation and benefits directly from it. Accordingly, it concluded that Logic Planet is not an employment agency, and although it is required to register with the state, it is not required to obtain a license. It further recognized that Logic Planet is registered with the Department of Consumer Affairs as a temporary help service. Accordingly, it denied Ms. Uppala’s motion to dismiss. The takeaway from this case for employees is that if you worked for an employment agency or a temporary agency, your former employer may not be able to enforce your non-compete agreement or other employment contract if it was not properly registered or licensed with the state.